Ferrari hopes to save a fortune in energy costs as a result of this move. 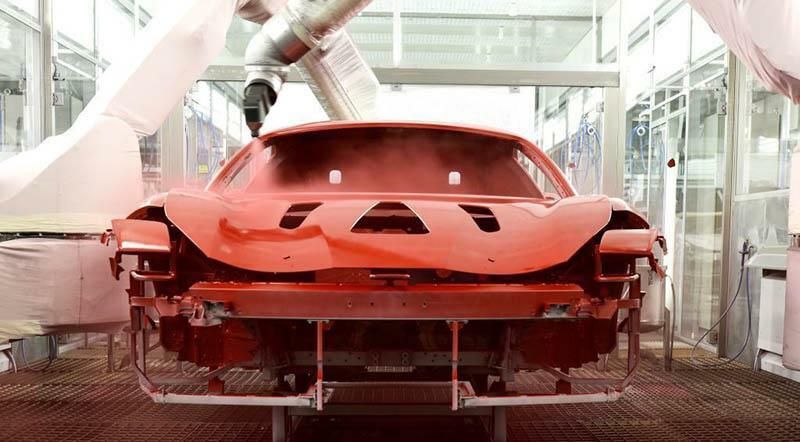 Ferrari has partnered with PPG to become the first automotive brand to embrace the brand-new Low Cure clear coat technology. The use of this ingenious low temperature paint technology is a testament to Ferrari’s commitment toward a better sustainable and innovative future. This is certainly not the first time Ferrari has done such a thing. In 2004, the automaker won the race to become the first automotive brand to endorse the water-based paint technology. The new paint system uses a unique clear coat that allows the paint to settle at 100 degrees instead of 150 degrees. Ferrari hopes to save a fortune in energy costs as a result of this move. The Low Cure resins carry a special new hardener that makes the chemical and mechanical elements submissive to the coating. Furthermore, the new paint technology incorporates cross-coat linking, which enhances the water permeability and chemical hydrophobicity. This breakthrough low temperature paint technology also gives automotive companies the liberty to paint carbon fiber components with the rest of the body, which will result in the same color tone throughout the body. Ferrari has already pushed its efforts to produce at least 61 basecoat colors which are being mixed with a number of metallic, gloss and matte pigments to provide more choices.